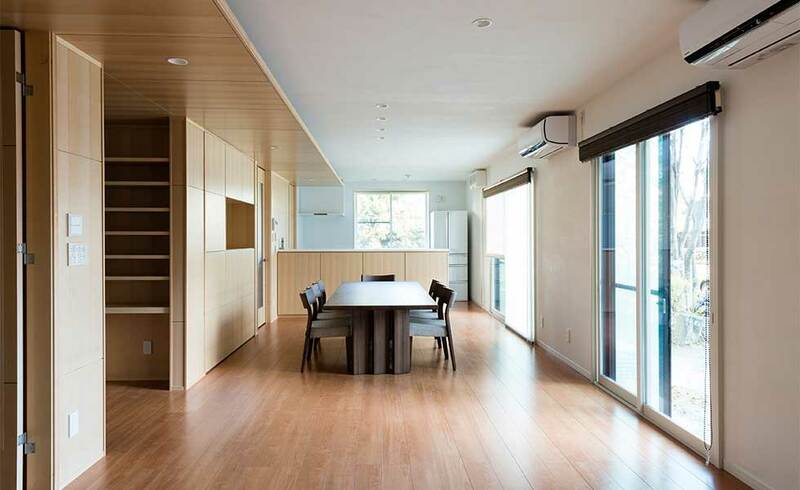 House I is a 20 year-old 180.7m2 house located in Nagoya city. 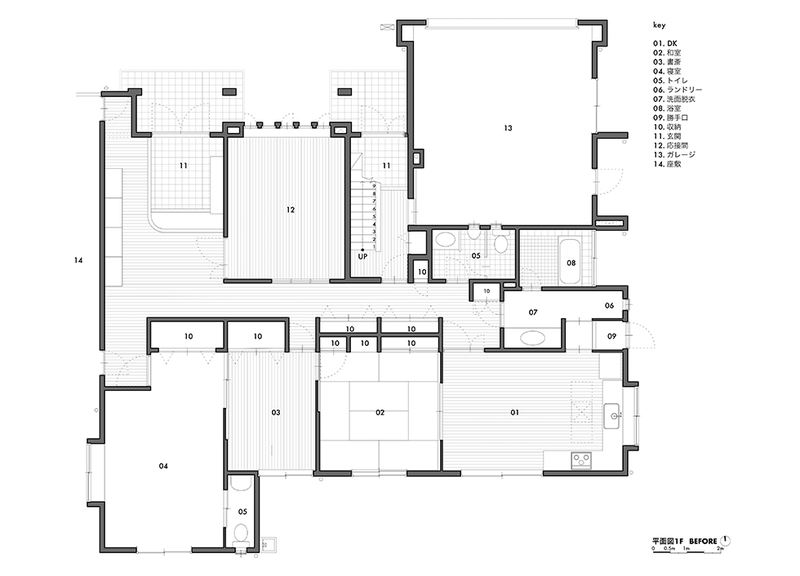 This 1F renovation was carried out for a couple in their 50s with the following requests. 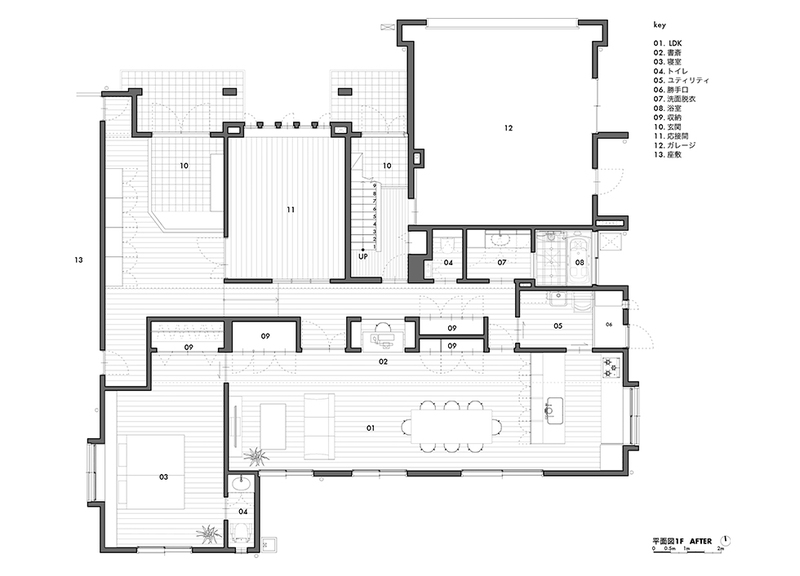 Using the original setup of the main living area, we removed the partitions and created a space that joined the three original spaces together into one continuous LDK. In the corridor, the partition between the corridor and the LDK was originally a simple storage space, but with a more efficient setup, it was possible to add the new study space. 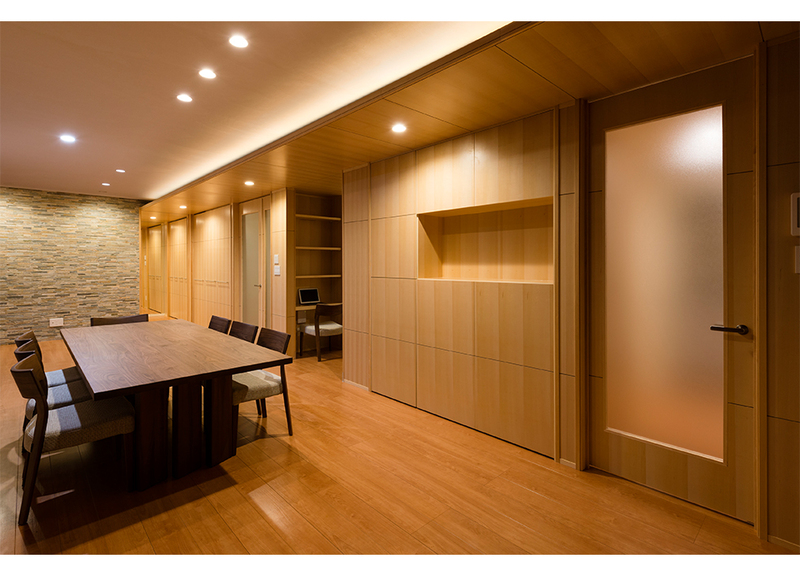 Both sides of this study area were made from a semi-transparent material, rather than opaque wood, to allow light to travel freely, and form a connection between the two spaces. The act of studying itself can be quite a solitary and isolating experience. By placing this study area in the very centre of the house, a very active location, the student is liberated from their room and, even if working in silenct concentration, can still be a visible and appreciated member of the family unit. In deciding to make the door to the main bedroom into a sliding door, it was possible for the living room to discreetly become a continuation of the main living area. Even in a private space like a bedroom, it is still possible to sense the presence of others in the residence. When left open, this door not only ensures good ventilation, but thanks to a ceiling-height mirror, the LDK appears to extend into infinity and creates an impressive illusion of depth. Narrow corridors and dark hollows were redesigned to make better use of available space and light and can now be used as effective storage spaces. 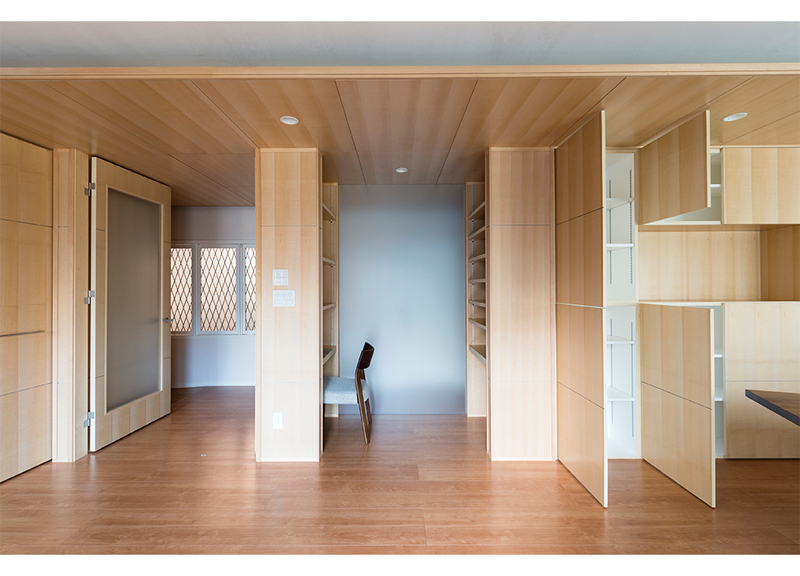 The corridor’s folded ceiling was slightly extended into the living area to further create unity between the two spaces whilst providing variety in vertical distances in the large room. The bedroom ceiling was given additional height to cleanly distinguish the two spaces family and private, even without a wall. By illuminating the walls and ceiling indirectly, it was possible to characterise the lighting of the space with shadows, creating a wide variety of shades, tones and textures. To further accentuate this, all light-facing surfaces are covered with reflective, insulating materials adopted by the space industry for use in spacecraft and space suits. For the walls, German plaster and natural wood were chosen due to their moisture-conditioning, deodorising, mildew-proofing and fireproofing qualities. The result is not only aesthetically refined but also environmentally sound and high-tech. A combination of red cherry timber, stone and decorative maple form a clean color scheme that compliments soft shadows to create a warm atmosphere rich with quality and class. Through use of Eco-Farm and sash windows, a space is created that is not only original, and elegant, but also comfortable and energy-saving.